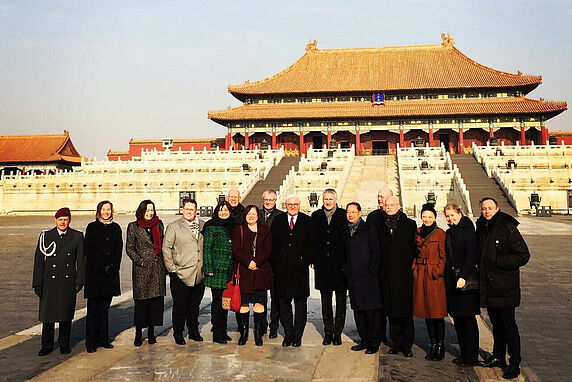 Daniela Stockmann was part of the President’s delegation to China, focused on ethics and digitalisation. 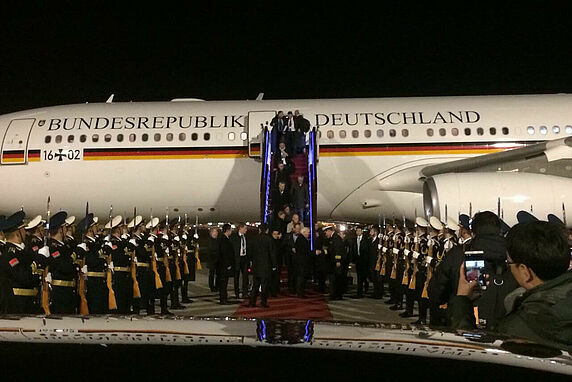 Daniela Stockmann sits next to German President Frank-Walter Steinmeier. Daniela Stockmann had just dipped into a bowlful of steaming noodles at a banquet in Chengdu, China, when everyone stood up at once and her meal was swiftly whisked away. 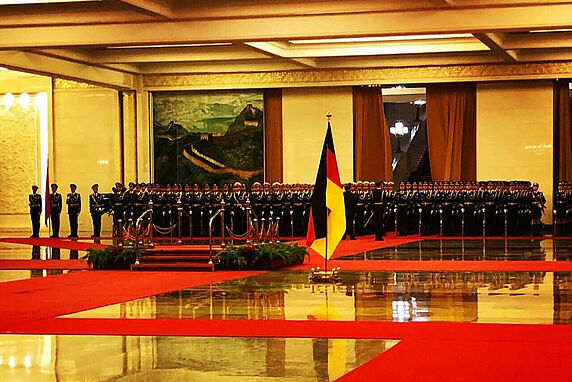 It was the first of several state banquets during German President Frank-Walter Steinmeier ’s five-day trip to China in December, accompanied by a delegation of culture and business experts. “One of the things you learn on a trip like this is the importance of signalling,” Stockmann said. “For example, at a banquet, the dignitaries are served first and – accordingly –- they finish first. Everyone is asked to stop eating when they are done.” The role of the accompanying delegation also depends heavily on cues: listening, providing feedback, and giving policy advice when needed. The theme of Steinmeier’s visit was “ethics and digitalisation”, a topic closely related to Stockmann’s research on China at the Hertie School of Governance in Berlin, where she is Professor of Digital Governance. Having studied China and digital governance in Germany, the US and China, her insights from the three cultures were of particular interest at a time of rising trade tensions and the expansion of Chinese trade and business influence around the world. In Guangzhou, the first stop, the group took part in the roundtable with Chinese business representatives. 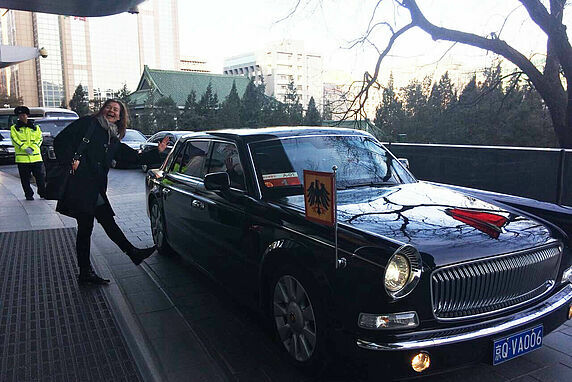 “Guangdong province is kind of the Silicon Valley of China,” she explained. Through her European Research Council (ERC)-funded research on social media platforms in China, Stockmann has studied the business models of a number of Chinese companies. This helped inform the discussion, and she could ask more pointed questions, based on her knowledge, to companies like Huawei, which has recently been in the news due to allegations of fraud against the company’s CFO Meng Wanzhou. A related topic frequently raised on the trip was China’s plan for a so-called Social Credit System (SCS) – a national system of collecting vast amounts of data for assessing the social and financial standing of Chinese citizens. She is teaching a project course in spring 2019 at the Hertie School on a related subject – “Digital governance in China: How to pitch high-quality data to non-governmental actors”, which focuses on the current pilot projects of the SCS in China, among other topics. But there is also a good deal of uncertainty about how the SCS will be implemented. “From the outside, it is easy to regard the Chinese political system as totalitarian. But the reality is that it is a fragmented authoritarian state,” she said. 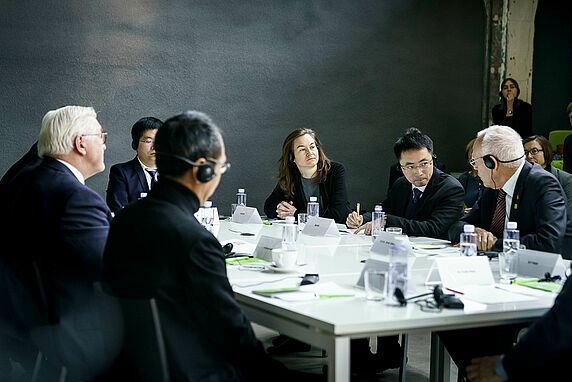 Based on her research in this area, Stockmann was able ask more specific questions of the Chinese delegation: “The Chinese participants confirmed that the government is aware of the fragmentation of the SCS. It is currently impossible to combine all the data gathered via eight commercial pilot projects.” In addition, China’s political system is not conducive to such a national project, as local governments are reluctant to be monitored by the central government for fear of losing autonomy, she said. The trip covered a great deal of ground – both geographically and topically. 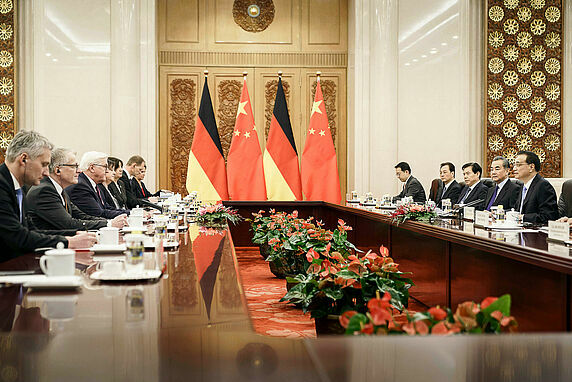 In addition to several professors with ties to China, Steinmeier’s entourage also included a translator of Nobel prize-winning literature, a German blogger with over 5 million followers in China, a former judge of the German Supreme Court, the President of the German Academic Exchange Service (DAAD), the head of the Berlin-based think tank Merics, the CEO of the Alba Group, and a board member of the German association for start-ups.